Prickly pear was originally introduced into Queensland as a hedging plant on stations and other properties. Due to the hardiness of the plant, it began to spread over prime agricultural and grazing land and impact on the efficient use of these lands by farmers and graziers. I have the honor to bring under your notice the fact that Prickly pear is growing in abundance in the Mungindi District in Queensland near to and along the boundaries dividing New South Wales from that Colony . . . Birds carry the seeds and floods wash the leaves and plants down the streams from the infested localities thereby imposing a heavy tax for their destruction upon land holders in New South Wales who would otherwise be free from the pest. As New South Wales has an Act enforcing upon occupants of land the eradication of the Prickly pear and in fairness to the people of New South Wales, Queensland should be in the same position. The recommendations of McGee’s report prompted the Colonial Secretary’s Office Sydney to send a letter to the Colonial Secretary’s Office Brisbane in May 1888 which invites the Queensland Government to do something about the problem. Legislative action should be taken that this noxious weed may be exterminated. Section 156B of the Local Authorities Amendment Act 1910 declared that prickly pear was a noxious weed. Local authorities were charged with certain responsibilities to assist with the eradication of prickly pear within their council areas. 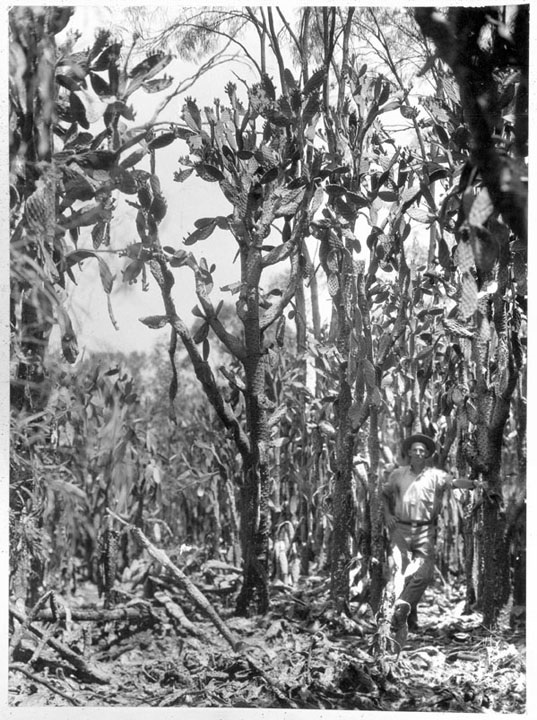 A report from the Warwick area in 1918 indicates that prickly pear, and other similar plants, were still a significant problem in agricultural and grazing areas. It was the introduction of the stem-boring cactoblastis larvae in the later 1920s that saw success in this weed’s destruction. A c1930 map, which illustrates the main prickly pear areas in Queensland and New South Wales, highlights the difficulties still facing farmers and graziers when attempting to eradicate the plant.